An international team of researchers has found evidence of Denisovans interbreeding with modern humans in Southeast Asia more recently than thought. The group gave a presentation at this year's meeting of the American Association of Physical Anthropologists outlining a genetic study they conducted. The Denisovans were a species or subspecies of humans that are believed to have lived in Asia and Southeast Asia. Little physical evidence of their existence has ever been found, all of it in Denisova Cave in the Altai Mountains in Siberia. But much more evidence of them exists in our genes. Like Neanderthals, the Denisovans interbred with humans. It is currently believed that as humans migrated out of Africa, they encountered and mated with Neanderthal—as they moved farther east, they encountered and mated with the Denisovans. In this new effort, the researchers report evidence suggesting Denisovans mated with humans possibly as recently as 15,000 years ago, in Papua New Guinea. The researchers collected tissue samples from 161 people (representing 14 groups) in Indonesia and Papua New Guinea and sequenced their DNA. They report that in the samples from people in New Guinea, they found evidence of Denisovan DNA from populations that were different from those living in the cave in Siberia. They describe them as D1 and D2 (the population in Siberia is described as D0). They report further that D1 and D2 were so distantly related to D0 that they had to have diverged at least 283,000 years ago. They also found that D2 was so distant that it likely split off approximately 363,000 years ago. The researchers suggest such distant divergence makes D1 and D2 as different from D0 as they were from Neanderthals. They also suggest that D2 might even have to be reclassified to give the group its own name. And finally, they reported that they had found evidence of Denisovans interbreeding with modern humans between 30,000 and 15,000 years ago. Interestingly, Bence Viola, with the University of Toronto, announced at the same conference that two pieces of a braincase found in Denisova Cave back in 2016 had been identified as having come from a Denisovan—the first skull fragment to have been identified as Denisovan. The minimal survival (interbreeding) age range is 15-30 kyrs ago. I read somewhere the skull fragments are robust like the earlier found teeth, as opposed to Neanderhals and Africans, so possibly a significant trait. Coincidentally, the Red Deer Cave people - who were either robust Africans or something else - lived in East Asia 11-15 kyrs ago [ https://en.wikipe...e_people ]. The secret to our success is that we will shag practically anything. Can I ask what you mean by "robust"? In biology, robustness is used to describe a species with a morphology based on strength and a heavy build. The alternative morphology is the gracile body type. So now we're getting a picture of multiple species where we thought there was only one, do I have that right? Spread the gene seed far and wide! No. These are not species, but subspecies. There's a big difference. However, if you noting an abundance of lineages, that would be accurate -- but that information's been around for a while. It's not news that PNG (and other) populations carry Denisovian genes. What is news here is the shallow time depth for the most recent interbreeding. Pretty sure the Denisovans didn't sign their cave painting 'KH'. 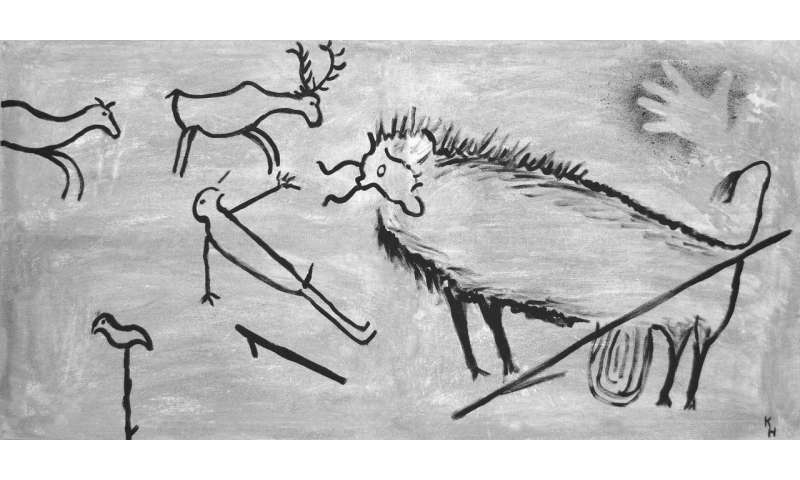 In fact, no cave paintings by Denisovans (D0, D1 & D2) is known to exist. Think the Sahara covers up with sand a very great deal of 'one day to be found' archaeology. Perhaps the cradles of both the Neanderthalers and the Denisovars. It is highly unlikely that any single form of biped ape evolved solely in Africa. The existence of these sub-humans in far-flung places pretty much proves it. gee pony-boy, racist much? That simian skull on your shoulders must be feeling stuffy? The difference between species, sub-species & races is the ability to interbreed. The evidence is not in yet for all the definitive conclusions as people vie to grab headlines. Perhaps D1 & D2 may be proven to be separate races of Homo Anthropophagus? As if the term "separate Human races"
Then it may turn out that D1 & D2 are separate sub-species along the Hominid lineage. The evidence for Denisovan & Neanderthal inhabiting overlapping territories, based on the Climate Changes they had to endure? Displays how complicated these relationships can get. & only pseudo-scientific frauds of the eugenics cult still hold to the delusion that that our ancestral Great Apes evolved outside of Africa. Among other issues, you need to get a handle on the time depth that's being talked about here versus the time depth for biped apes evolving in Africa. In the one case you'd need to be talking about several million years, and in the other, a few tens of thousands. Big difference. That, and the complete lack of evidence for what you're proposing. "The Denisovans or Denisova hominins ( /dɪˈniːsəvə/ di-NEE-sə-və) are an extinct species or subspecies of archaic humans in the genus Homo. Pending its taxonomic status, it currently carries temporary species or subspecies names Homo denisova, Homo altaiensis, Homo sapiens denisova, or Homo sapiens Altai." Lions and tigers can mate but they choose not to. Violently. Speciation is the 'urge to diverge'. Once separate groups accumulate adaptations to unique niches, they are reluctant to give them up to interloper diluters and polluters. But interlopers have much to gain for their offspring by mating with indigenes. They can steal adaptations rather than wasting many gens adapting themselves. -So the evidence in the above article likely describes the more virulent and aggressive tropical cromags overrunning yet another temperate-adapted species that could not replace their losses as fast. Overrunning, killing all the males, incorporating the females. Tribalism, the human version of group selection. An age-old formula. @WG: Good question. @CS: Thanks! Yes, that. @DS: A Denisovan N/S split has been seen before, but the discussed work splits the SE Asia Denisovans into two populations (and considering the suggested split ages the data should be solie). Moreover last week there was news that the N population may be split in two as seen in Tibet genomes, but we all need to see the data published! And Pääbo has been video published from a public seminar when they were working on that, suggesting that in his opinion Neanderthals was a different species. Speciation is gradual, and same as astronomers debate how to divide gas giant planets and brown dwarf stars biologist can have opinions here, there is no right or wrong (so far). I held to a clear "subspecies" potential before. But precisely Pääbo's et al Neanderthal work showed that there was a beginning species barrier, the hybrid fitness dropped over 10 generations with a factor 2 to 5 until the Neanderthal alleles were effectively under drift again. This explained the now seen dilution which differences in population numbers did not entirely in their work. So this may be a case of neither species nor subspecies status, if you want to label the branching process even more finely. Again, I doubt that people can point to anything "right or wrong" in this. @TGO: There is to my knowledge no generic innate "urge to divide", though you can see that outcome under sexual selection in some groups of birds when the "slightest" difference in shroud or song support mate choice separation. Geographic isolation is necessary and (likely) sufficient. And the same appends to the idea of group selection. So far ("selfish") gene selection has been necessary and sufficient. -- Can I shag it? -- Can I kill it? -- Can I eat it? "Sympatric speciation is the evolution of a new species from a surviving ancestral species while both continue to inhabit the same geographic region. In evolutionary biology and biogeography, sympatric and sympatry are terms referring to organisms whose ranges overlap so that they occur together at least in some places. If these organisms are closely related (e.g. sister species), such a distribution may be the result of sympatric speciation..."
-but it fails to address tribalism. And so much else. So what do we call these, "races" of Denisovans? otto, I am still waiting for that list from you. Of ANY Primates, Anthropoids & Hominids that did NOT, do NOT live in tribal societies. Ayn Rand would be very disappointed that you have failed to point out that the most noticeable difference between bipedal monkeys & Modern Humans is individuality. "Sympatric speciation is the evolution of a new species from a surviving ancestral species while both continue to inhabit the same geographic region. In evolutionary biology and biogeography, sympatric and sympatry are terms referring to organisms whose ranges overlap so that they occur together at least in some places..."
Nice copy/paste from Wikipedia. Sympatric speciation remains rare, and isn't as well-understood as it will eventually be. You seem to be championing it as a common occurrence; it's definitely not. Otto, read the rest of the Wikipedia article, particularly the last two sentences. If you will, please. I've retired from the academic fray but still do my best to keep up, but only by subscribing to Nature and Science. Everything else, I've let lapse. I am baffled that several commentators opinions seem to suggest that these matings were planned, organized, legislated? They sat around the campfire debating what they wanted to accomplish with planned breeding programs for specific character traits & physical beauty? You all make it sound as if it was voluntary or elected behavior to choose or spurn a mate. Nothing about random chance? "Gee, you look lonely, tonight... Can I buy you a beer?" When were females ever allowed to choose? All these terms are descriptive categories by parochial pedants seeking to justify modern behavior. "Sympatric speciation remains rare, and isn't as well-understood as it will eventually be. You seem to be championing it as a common occurrence; it's definitely not." Thx, that. I rely on speciation specialist Jerry Coyne, which is highly critical of putative examples on his site; IIRC a couple of years ago he said roughly all non-sympiatric examples had been shown to be ill supported. But that can have changed, we have more genetic methods now, say.